It’s not ordinary sweets that Taza makes, either. 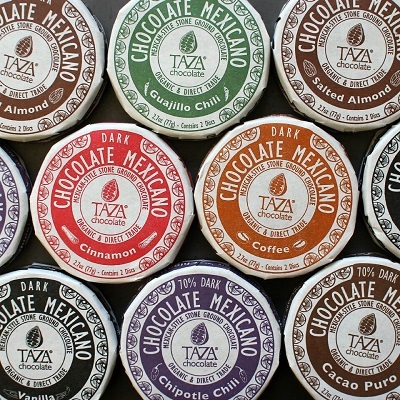 They specialize in stone-ground chocolate, a process the founder, Alex Whitmore, came across in Mexico. It produces a more intense, rustic flavor from the cacao beans. Inspired by Mexican traditions, he learned how to make the hand-carved granite mill stones and returned home to start the company with his wife, Kathleen Fulton. It’s not an easy process, though. 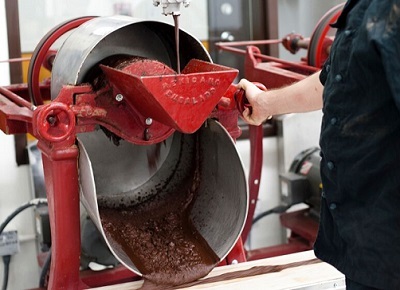 They do everything themselves in Somerville, from roasting to winnowing to grinding to refining. “On the scale that we’re doing it, there’s definitely a lot to master.” Mallen, who has been with the company for six years, says the machines can also be quite temperamental. Because of this, the workers must be in tune with the process, able to detect any hitches through sight, taste, sound, and smell. Still, it’s also important to be economically and socially conscious. That’s why Taza sources its beans directly from the farmers. “We work very closely with our growers because we look for a certain quality in our cacao.” Because of this close relationship, they can be sure that the farmers get a good deal and that they’re not using reprehensible practices, like slaves or child labor. That way you can enjoy your chocolate guilt-free.